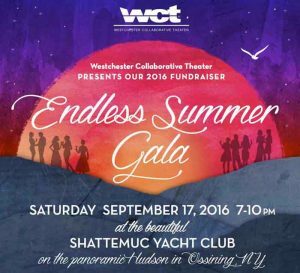 Ossining, NY – On Saturday, September 17, from 7 to 10 pm, Westchester Collaborative Theater (WCT) will host their annual fundraiser “Endless Summer Gala,” an event benefiting the theater company. It will be an elegant and entertaining evening overlooking the Hudson River from Shattemuc Yacht Club, 46 Westerly Road in Ossining. The event will feature live music, guest speakers, an open bar, delicious hors d’ouvres, the 2nd Annual Members & Audience Choice Awards, silent & live auctions and a big ticket raffle. Tickets are $75 pp or $130 per couple, and can be purchased through their website http://www.wctheater.org/current-tickets.html or by mailing a check to WCT, PO Box 522 Ossining, NY 10562.
work for the stage and bringing live theater to the community.